Winchester's Ranger T-Series is a perfect choice for high quality self defense ammunition. These new production rounds are loaded into boxer primed nickel-plated brass cases that are re-loadable. Each projectile in this box of 50 is a 124 grain jacketed hollow point that leaves the barrel around 1,180 feet per second. T-Series ammo is specifically designed to offer the perfect balance of penetration and expansion. The six pedal SXT projectiles maintain near 100% of their weight even after penetrating most barriers. Winchester is one of America's oldest outdoor companies. Since 1866, they have been producing high quality firearms and ammunition that shooters and hunters use and trust. 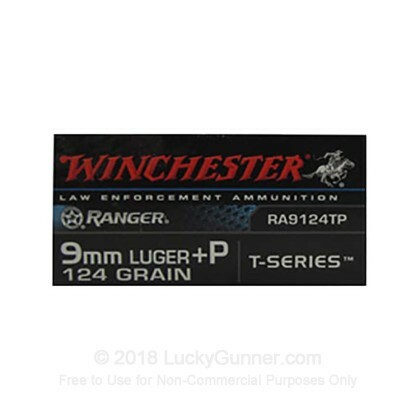 Their T-Series line of self defense ammo performs at its best by delivering superior accuracy and excellent stopping power for when things are at their worst. Winchester's ammunition is American made. For decades Winchester has supported wildlife conservation as well as shooting sports organizations to help keep our outdoor way of life strong. Pick up a few boxes of this high quality 9mm self-defense ammunition today! In order to find out how different self-defense handgun loads perform, we decided to do some ballistics gelatin testing of our own. 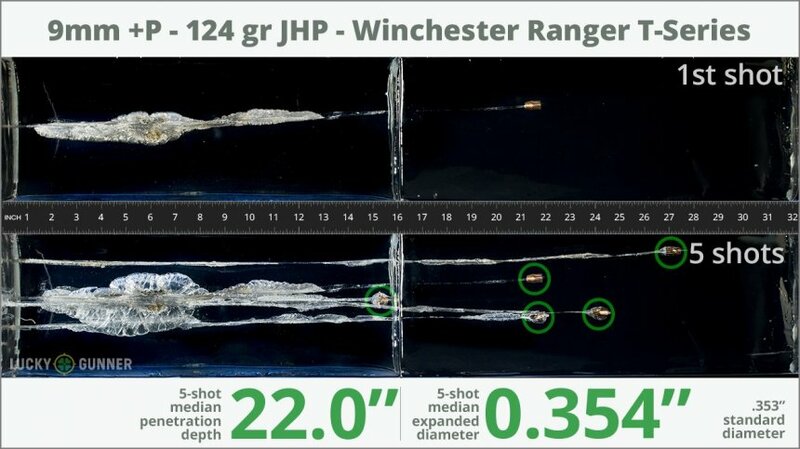 The chart below is a compilation of expansion and penetration data for Winchester 124 gr Ranger T-Series +P ***NEW*** fired from 10 feet, through four layers of fabric (to simulate clothing), using a Smith & Wesson M&P9c pistol. 0.90" This ammo: 0.354" Min: 0.32" Median: 0.50" Max: 0.90"
22" 0" 5.6" 17.7" 47.5" This ammo: 22" Min: 5.6" Median: 17.7" Max: 47.5"